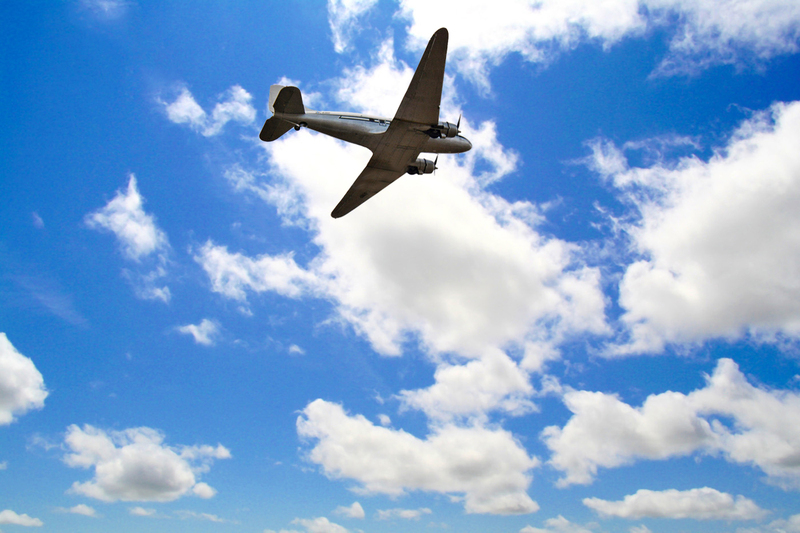 In 1938, standing in my front yard, playing with my dog Pal, I heard a great big DC-3 fly overhead and I said to myself “I’m going to fly in one of those planes someday.” Then I found out you had to be a nurse to become a stewardess. Going through nurses training to become a stewardess and not being a practicing nurse seemed a waste to me. So that dream was forgotten. When I was a senior in high school, the Minneapolis school system had a brand new program that had business people come to the high schools and give talks about their careers. When I saw that a Northwest Airlines stewardess was coming to our school, I immediately signed up for her talk. After she finished, I raised my hand and asked her if you still had to be a nurse to be a stewardess? She answered “Oh no, that regulation was dropped quite a few years ago.” Back to my dream! 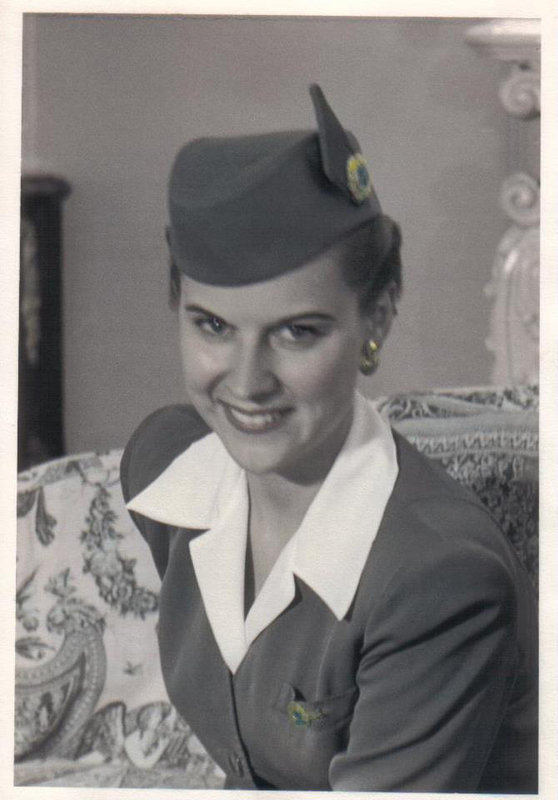 I went to see my sister’s friend Zell McConnell, who operated a stewardess school and asked her how to become a stewardess. She told me I needed two years of business experience, or two years of college and at least 21 years of age. Off to the University of Minnesota I went. Diploma in hand, I arranged to go to Chicago on the train the second week in March, 1949, to talk to American and United about the job and fill out applications. I had also written to a small (or so I thought) airline called Pan American that flew from Miami to Havana because I had five years of Spanish in school. They wrote to me saying they would be in Chicago interviewing that same week. I was interviewed by a Purser and a Stewardess with Pan Am on a Monday, neither of who could speak as good Spanish as I could. Tuesday I went to Chicago Municipal Airport to talk to American and United and fill out their applications. Late afternoon on Tuesday, Pan Am called to tell me I was accepted providing I pass their physical on Thursday. On Thursday afternoon, they called to say I passed and was to report to Miami the next Monday on March 15th. I took the train home Friday night and packed over the weekend and left for my flying career on Monday. Was I ever shocked to find out in Miami that I had just joined the largest airline in the world! What did I know? They didn’t fly to Minneapolis. Incidentally, I never did apply at Northwest because they had just laid off 500 people. 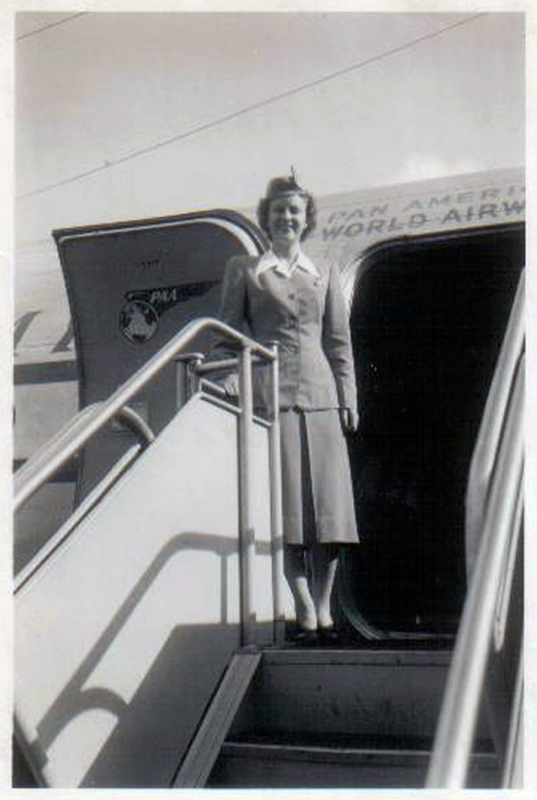 Going away to become a stewardess was a daring feat in those days – for a girl. A few weeks after arriving in Miami I received letters from American and United requesting I arrange for an interview with them – too late! The interviewers told me they had hired a girl from Alexandria, Minnesota, and gave me her phone number so that we could travel to Miami together. Her name was Judy Landeen. I called her and off to Miami we went by train. On the train, another girl, by the name of Dotty Rice, introduced herself; she was from Chicago. We were to report to the Manhattan hotel. The company would pay for the first three nights, and then we had to find a place to live. At the hotel, we met another girl, Evelyn David. We all agreed to room together. So there we were. Now what to do? How do you find a place to live? The first thing we had to do was to rent a car. I had been driving for six months and I was the only one who knew how to drive. I didn’t tell them I had been driving such a short time because they would have been scared to death. We bought a newspaper and started looking and found a home in Hialeah, close to a bus stop so we could get to the airport. 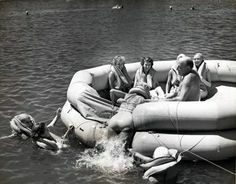 carry the trays, ditching procedures, (which were held in the water in Miami Bay), but most of all that the plane was our home in the air and passengers should be treated as we would treat guests in our own homes. Regarding appearance there was no make-up class at school. Girdles were mandatory. There was no regular weigh-in , and I don’t remember ever seeing a heavy stewardess. Even though we flew into the hot tropics, jackets and hats were mandatory at all times, and we always had our white gloves. Shoes had to be brown and Pan Am issued our brown purse. They later changed the purse to black and issued new purses but we still had to buy the shoes. Deductions for our first uniform were about $50 a month from a monthly salary of $187.50. We flew about 15 days of every month, during which time we were supported by the company and per diem, but we still had to eat a lot of peanut butter sandwiches to make money last. Everyone’s first trip was to Havana and the second one to Caracas. My first trip was in the middle of a terrible tropical storm. It was my first ride on an airplane and the purser was worried I would be too scared to help him, but I just thought it was like being on a roller coaster. Next came Caracas, Venezuela and then San Juan, Puerto Rico and many of the islands in the Caribbean. We flew to the north coast of South America from Panama City via Trinidad, with stops in Columbia, Venezuela, and the Guayanas. The greatest trip was for two weeks to San Juan, Puerto Rico, Port of Spain, Trinidad, Belem (on the Amazon), Rio de Janeiro and Sao Paulo, Brazil, Montevideo, Uruguay, and Buenos Aires, Argentina. Click here to read Part II Some Things Aren’t Covered in Training! What a wonderful recollection of your “flying adventure”! It seems like yesterday to me, even though I began my call to adventure in the early 70’s. 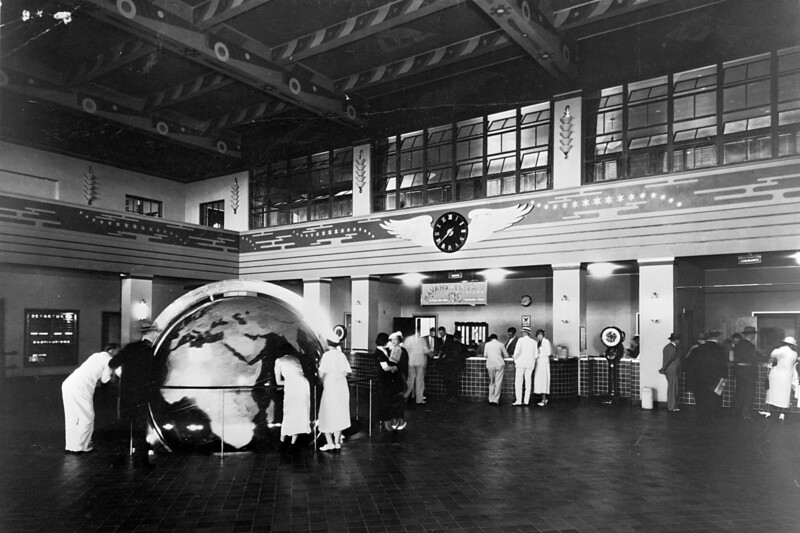 It was new, fun, and an exciting new world opened up for me with Pan American. We will always have our memories even though Pan Am is gone.